when you purchase a full size grow box or tent in March! Two completely seperate grow chambers; grow your clones at the same time your main crop is fruiting/flowering! 2014 Model Shown. All 2015 full size Grow Boxes now have the dropped floor for an extra 4" of grow height! 100% of light is blocked inside and all our boxes are whisper quiet! Nothing hangs off the back of a Grow Box USA Grow Box! 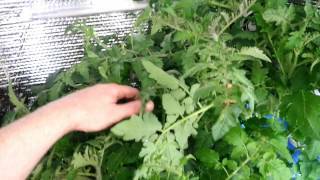 Shown with Standard DWC/Drip Feed Hydro System. Our exclusive backup reservoir and zero maintenance water cooler make for the most stable hydroponic system you can buy. Our new for 2017 optional Duo-Drive Switchable 5 Watt Diode LED Lighting! New for 2015! We have dropped the floor 4" allowing more room for your plants! All Hydroponic Grow Boxes are completely turn-key inlcuding CO2; just add seeds and water! Featuring two completely seperate grow chambers each with its own Patent-Pending Air Scrubbing system. 100% Odor control is guaranteed! Less than 8 weeks into our latest Duo Drive Cherry Tomato Grow! Amazing Cherry Tomatoes less than 9 weeks from seed! Week 9 from seed, amazing Cherry Tomatoes! Day 49 of our Fullback Cherry Tomato Grow, look at those healthy roots! View your grow remotely with the Grow Box USA Cab Cam! New for 2017, add up to 40 degrees of heat to your grow box! This Handcrafted in the USA stealth hydroponic grow cabinet is big and potent! Measuring 4 feet wide and 6½ feet tall, Grow Box USA's patent-pending Silverback is not for the faint of heart! 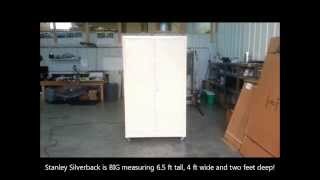 Just like all of Grow Box USA's cabinets, the Silverback is completely turn-key, is whisper quite, runs extremely cool, leaks no light and guarantees 100% odor control! Don’t settle for a cheap inferior product, the Silverback is loaded with standard features not found on our competitors’ products. Features such as our patented main reservoir Water Chiller, up to 480 watts of potent, cutting edge LED lighting, optional LED side lighting, CO2 system, patent-pending and 100% effective air scrubbers, real outlets with GFI protection, extremely quiet operation and much more! Also standard are separated propagation and fruiting/flowering chambers allowing you to increase your annual yield by having clones grow at the same time your main crop is fruiting/flowering. This means nearly twice as many harvests every year plus you are able to keep your plants genetics for life! For cool weather climates add up to 45 degrees of heat to your grow box with the optional Grow Box USA exclusive Cold Weather System. This works just like your house, set the thermostat and forget it! We have also upgraded our Duo Drive LED diode specs plus have added as an option our Grow Box USA Aero Hydroponic System! The grow box includes six whisper quiet exhaust fans, dual circulation fans and costs less than $30 a month to run. New for 2018 add side lights for a wider grow band and bigger yields! Monitor and control your grow from your computer, laptop or smart phone! All our grow boxes make excellent odor proof dryers! When you harvest, simply remove your lights and reservoir. Then hang your plants from the light hooks. During the three to five day drying period, all odors will be removed -- so your house will never smell like curing plants! Increase your annual yield by growing clones at the same time your main crop is fruiting. This means nearly twice as many harvest every year and you are able to keep your plants genetics for life! By using our included CO2 system, your plants will grow up to 30% faster and produce heavier yields. With 25+ years of growing experience count on our team to provide you with superior after the sale support to ensure you get great results! We'll help you become a grow expert in no time. Five year warranty the Box itself, three year warranty on the LED lights plus a one year warranty on everything else. Watch videos about this product! Please click on any thumbnail to view the video. How much is shipping on this product? Ship your grow box anywhere in the continental US for one low rate! For international orders, please email or call for a quote. Curbside delivery* (end of your driveway) is standard while inside delivery (inside your garage) is available for an additional $75. Most orders ship within two to three business days by standard freight. Other locations are available, please email for quote. If an order is submitted without international shipping included, we reserve the right to add the additional fee to the order after the sale is complete. Orders shipped outside the lower 48 US states or Canada are shipped in heavy-duty shipping crates to protect the cabinet during the journey to you! International pricing normally includes curbside delivery to your address. International customers may be responsible for any additional costs such as (but not limited to) duty, warehouse, and customs charges. A 600 Watt or greater power inverter is required in some countries as all cabinets are US standard 110v 50/60hz (We offer a 1500 watt power inverter with surge protection). * Residential delivery is not available in all countries. Customer may need to pickup or arrange delivery from closest available freight station. How much space does my new cabinet need? All Grow Box USA cabinets need just two inches of space on all sides and 6" up top. Our cabinets can be placed in a very small area as long as the room is properly ventilated. What temperature does the room have to be to use the grow box? Our grow boxes are designed to operate with room temperatures as low as 63 degrees and as high as 80 degrees Fahrenheit, depending on model. Your competition told me that your grow boxes allow mold to form under their mylar. What's the scoop? This is absolutely false! No, mold does not form under our reflective mylar nor anywhere else in our grow boxes. We tape all our seams and every square inch of our mylar is glued into place. There is simply no way for moisture to work its way behind our mylar, even if you spill water directly in the cabinet. We just disassembled our first prototype, after 3 1/2 years of use there was absolutely no moisture or mold behind the mylar. What can I expect for a yield from my new cabinet? Your yield depends on what type of plant you are growing. A general rule of thumb is The Misty grow box can produce 1-2lbs of dried fruits/vegetables annually, The Classic grow box can easily produce 10lbs+ of usable plant matter annually, and The Fullback and Silverback grow boxes produce even more! Why do you offer a net trellis system with your grow tent but not with your grow boxes? We recommend using the "Low Stress Training" technique instead of a net trellis with our grow boxes. With Low Stress Training, you bend your plants into the corners and tie them down; this allows you to control where your plants grow. This technique allows you to use every square inch of your grow box, with a net trellis you have very limited control. A net trellis works great in a large tent where you don't have the time to tend every plant individually. Our competition uses net trellis as a sales gimmick with their grow boxes; we are aware we may lose a sale or two because we don't offer a trellis in ours, but we will not sacrifice performance just to make a buck. How many plants can I grow in my grow box? Our competitors claim you can grow up to 16 plants in their main chamber and up to 50 clones in their cloning chamber yet their box is smaller than our Fullback... this makes no sense. The fact is they are exaggerating just sell their product. At Grow Box USA, we never mislead and always pass factual information on to our customers. Do I need to use a power converter? If you live in the USA or Canada, simply plug your grow box into any standard outlet. A power converter/regulator will be needed for international customers. For your convenience, we offer an extremely high quality power converter/voltage regulator at a great price. Simply select this option on the right when you order your grow box or tent. Just add seeds and water! The grow box comes with everything you need for your first two grows including all nutrients, PPM meter, pH adjusting kit, instructional DVD and more! Premium colors are an additional $275 and require a three week lead time. Not needed in the US or Canada. 84 Watt LED side lighting included. Grow box ships in 7 to 10 business days. View FAQ tab for international shipping rates. Call (715) 514-1190 to order a grow box now! For technical support, call (715) 514-1190. Get growing tips and special offers. * We don't spam, it's disgusting.